Saints Victor and Stephanie contested in Damascus in 160, during the reign of Antoninus Pius. 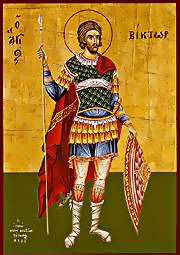 The pagans arrested Saint Victor as a Christian and cut off his fingers, put out his eyes, and beheaded him. As Saint Stephanie, the wife of a certain soldier, and a Christian, saw Victor's nobility in his sufferings, she loudly cried out to call him blessed and to say that she saw two crowns prepared, one for him, and one for herself. She also was taken, and was tied to two palm trees which had been bowed down; when they were released, she was torn asunder. As godly-minded athletes and Martyrs who strove for piety, the Church doth honour and glorify this day the godly contests and travails of Menas the prizewinner, noble Victor, brave Vincent, and valiant Stephanie, and lovingly doth cry out and glorify Christ, the Friend of man. Share the feast of Victor and Stephanie with an icon greeting ecard.